We had a crew of 12 that flew into Miami for the weekend. The process of renting the boat was seamless and easy, Sailo was incredibly responsive and on point to what we were looking for. The boat was spectacular! Incredibly well maintained, super clean and in excellent condition. On a scale 1 - 10, our experience overall was an 11! 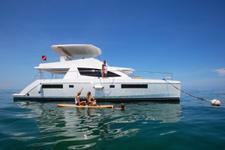 Our full-day trip on the Catamaran was the highlight of the vacation. 6 of us went (though you could fit double), and everything went smooth. The captain was not only nice and accommodating, but extremely knowledgable and helped us with our full itinerary. Sailo also did a great job of helping to coordinate extra activities (jet packs!) and lunch! Would HIGHLY recommend to anyone looking for a special experience.